When faced with a tight budget, the Elephas YG400 offers solid image quality and supports more than enough devices for under $100. You should be justifiably concerned when it comes to budget projectors. A sophisticated piece of technology isn’t usually an area you want to cut corners. In the case of projectors, spending more usually results in a clearer picture and more connectivity options. The Elephas YG400 is something of an exception to this rule. Sporting 1200 lumens, multiple ports including HDMI, USB, and VGA, and a potentially gigantic screen size, the $99 device is a gold standard among budget projectors. It’s not without some key flaws but you’d be hard-pressed to find a higher quality projector at such a low price. The Elephas YG400 has an oddly retro design that may or may not be intentional. The white plastic rectangle measures 7.8 x 5.75 x 2.78 inches, which is starting to stretch the definition of a “mini” projector. The front features an embedded lens with a detachable lens cap. The lens itself manually rotates in the front for focus, and the rear to adjust the keystone. It feels awkward and archaic, but it gets the job done. The Elephas YG400 has an oddly retro design that may or may not be intentional. The surface features a column of metallic navigational buttons, including Input, Back, Volume Up and Down, and Ok, along with a recessed power button and an amber-colored light to indicate if the device is on or on standby. The bottom includes a threaded hole for mounting or tripod use, as well as an adjustable foot ring to slightly raise the front of the projector. The rear has the VGA and power supply connections while the left side has a surprising array of ports: SD card reader (though not a micro SD), AV jack, Audio jack, HDMI, USB, and a second 5v USB slot for charging mobile devices. The Elephas YG400 is designed for home use and is ready right out of the package. The power supply adapter is located in the projector itself which creates two noticeable issues: the projector is a bit heavier than expected, and the 5-ft power supply cable is much shorter than what we’re used to. We had to break out an extension cord to test the throw distance. Connecting devices is as easy as plugging them in and selecting the source from the input button or the menu via the remote control. The Elephas readily accepted HDMI Blu-Ray, a USB flash drive with video files, and an SD card loaded with pictures. It quickly read any file we threw it at, though it only has a native resolution of 480p. Navigation is done with either the volume buttons on the device or the included IR remote control (requires 2xAAA batteries, not included). The IR remote can be frustrating to use, however, as the IR receiver is located in the rear, and the Elephas YG400’s required throw distance will usually place it behind you. Picture quality matters most with projectors and it’s here Elephas smartly doubled down, providing the YG400 with an impressive 1200 lumens and 1000:1 contrast ratio. The native resolution of 800x480 is only really noticeable with stored pictures and video, as it supports up to 1920x1080 HD and 16:10 widescreen with HDMI connection. The throw distance is cause for concern, however. The Elephas YG400 requires a minimum of about 5 feet, or 60 inches from the projected image, as the lens is unable to properly focus if placed closer. A six-foot (72-inch) distance results in a nice 60-inch screen, but you’ll need to really start pulling it back to get a bigger image with its distance to screen size ratio of 1.4:1. At 100” we enjoyed an 80-inch screen, and got it up to 100” with nearly 10 feet of distance from the projector to the wall. Elephas lists screen size up to 130 inches, which would take about 13 feet. With budget projectors, it’s especially important to note where you hope to place the projector and how much room you’ll have to project the image. The other image concern is the angle. Unlike most projectors, the Elephas YG400 doesn’t naturally raise its projected image. If you put it in the middle of a table, it will reflect off the bottom of the table, cutting off lower portions of the screen, even when the adjustable knob on the bottom is raised. It’s an annoying quirk that, along with its throw distance, greatly limits where it can go in your home to maximize its screen size. Alternatively, it can be a motivation to get a ceiling mounting kit. Few projectors focus on sound quality and the Elephas YG400 scrapes the bottom of the barrel, though the sound carries quite far. When faced with loud cinema music and sound effects, however, the tiny speaker suffers from nasty audio distortion and scratching, even when as low as 50% volume. The sound quality can be adjusted in the menu screen, including options for Surround and SRS TruSurround XT, which boosted the volume up to impressive levels. Strangely both improved audio options are off by default. The actual quality doesn’t improve much, however, and we still experienced frequent audio distortion during loud sequences. An Auto Volume option helped mitigate the distortion and kept the volume at acceptable levels. Thankfully the projector includes a standard 3.5mm audio jack, which can easily connect to any external speaker (or headphones) to produce a much richer cinema experience. Given the Elephas YG400’s budget price, we highly recommend investing in a nice speaker system to compliment the visual quality. The projector’s fan also runs quite loud, which is common among cheap yet powerful projectors. The sound will often drown out any fan noises, and it’s recommended to avoid sitting too close the projector itself. The on-screen display is only accessible via the remote control, and we found it frustratingly unresponsive when pointing it at the front of the device. Several options are available within the menu to adjust the image, projection, and sound. Aspect ratio, color temperature, brightness, contrast, as well as projection mode such as rear or inverted, can all be easily adjusted and changed on the fly, without interrupting your movie or show. The media player easily played every video, audio, and picture file we loaded onto it, from OGG to PNG and FLV. It is not at all designed for office presentations, however, supporting only basic TXT for documents. 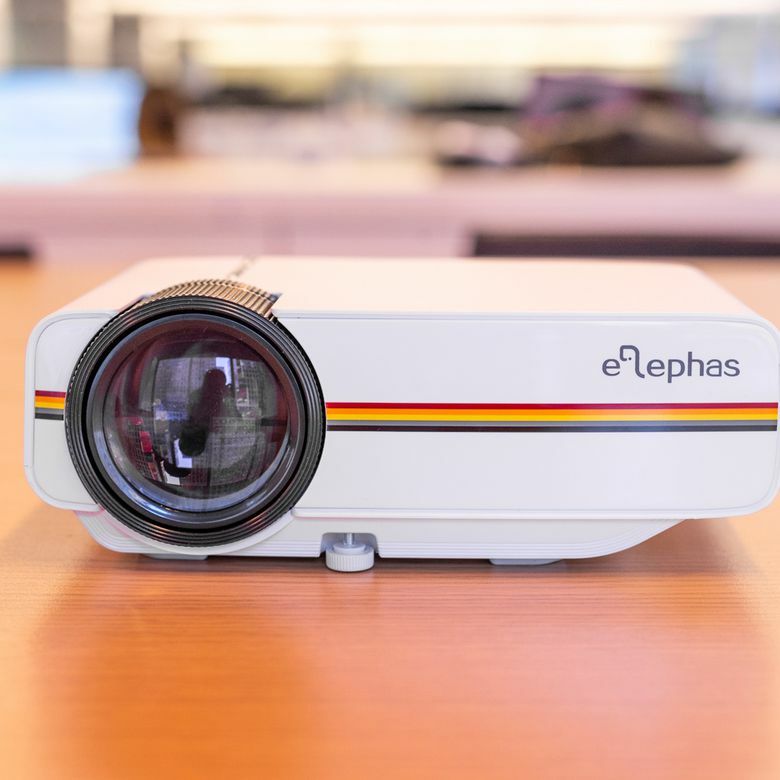 The Elephas YG400 is a solid projector even before its low price consideration. At $99, the YG400 is firmly in the budget range of mini-projectors, without sacrificing too much visual power. Budget projectors are often discounted up to 40-50% off, making them an even more attractive offer, though new ones are constantly releasing that squeeze more lumens and larger screens out of the tiny package. It’s not without some key flaws but you’d be hard-pressed to find a higher quality projector at such a low price. At the $70-$100 price range for projectors you’re not going to find much difference between brightness, connectivity, throw distance, or screen size, as more of these options become standardized. The DBPower T21 Mini Projector ($100) features the same ports (HDMI, USB, SD, VGA, AV) with a slightly larger screen size support and more lumens for a brighter picture. Same with the Cibest BL45 Mini LED Projector ($70). Throw distance is still an issue at this budget range, however, so larger screens will require bigger projection distances, including upwards of 15 feet. With budget projectors, it’s especially important to note where you hope to place the projector and how much room you’ll have to project the image. Want to take a look at some other options? See our guide to the best mini projectors. If you need a budget option, this is a good choice. With any tech product, you get what you pay for, but we were impressed with the overall picture quality for such a relatively cheap projector. The throw distance and screen angle requires careful placement in a large room for maximum enjoyment, and ideally some decent external speakers. Product Dimensions 4.4 x 4.8 x 2.2 in.